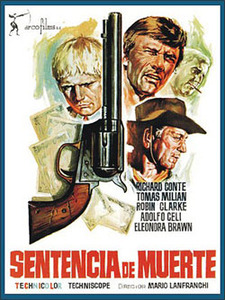 (1968 aka DEATH SENTENCE) Richard Conte, Robin Clarke, Aldolfo Celi, Tomas Milian. This fine spaghetti western starts with two heat-parched men walking stumbling through the desert. One man has two guns and no water. The other has water but no guns. What follows is a tale of seething tale of survival in this smartly done Euro-western. With English Subtitles. Color, Widescreen, 35mm.